Beast Master Hunts are cool, very cool. Offering you the chance to tame some of the games best animals. The big question on everyone's mind is how do you actually start the Beast Master Hunts? Why is there no location or quest indicator on the map? It turns out that the beast hunts don't automatically appear on the map after you complete Tensay the Shaman's first mission, even though the Beast Master skills group is unlocked. It's essential to go much further than this, completing more of the main story until the little hunt icons appear. 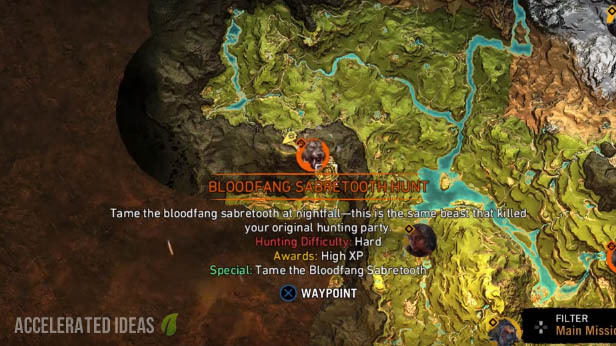 You'll know you've reached this stage once you see the Orange icon of the Sabretooth (south west corner of map), Mammoth (northern half of map), Bear (South East of map, inside cave) and Wolf (south of map). Take a look at the map locations below to understand exactly where each hunt takes place. This hunt starts during the day, not too far from your cave. Once at the top of the waterfall the game signifies that a hunt is nearby but a further grappling claw is need to reach the very top. Enter the cave to start this hunt. Venture through the cave, carefully following the path and using the grappling claw to avoid falling from a great height. Now follow the scent trails until you reach the Wenja hunter who speaks to you. Now take some time to build traps in the area while it's still daytime. Then take a well earned sleep and wait until nightfall for this awesome beast to appear. Fight with all you've got to damage this tiger using all of the traps you laid out previously. This trap, sleep, fight process is repeated a couple of times as you chase the tiger down to it's lair. Players should note that you can only tame the animal in it's final phase when it's almost dead. Venture through the cave area highlighted on the map, swimming through water and eventually arriving at a cave painting on the wall. Next follow the bears scent using you hunter vision. You will pass through several areas as you follow the bears scent eventually arriving at a region where Izila are fighting this massive beast. Now quickly grapple down the side of the cliff and prime the trap ready for the bear. Wait for him to come down the path and hit the trap then sprint across to the other side of the pond and prime the other smaller traps. If you inflict enough damage the bear will flee towards his cave where you can fight alongside your allies for another chunk of his health. 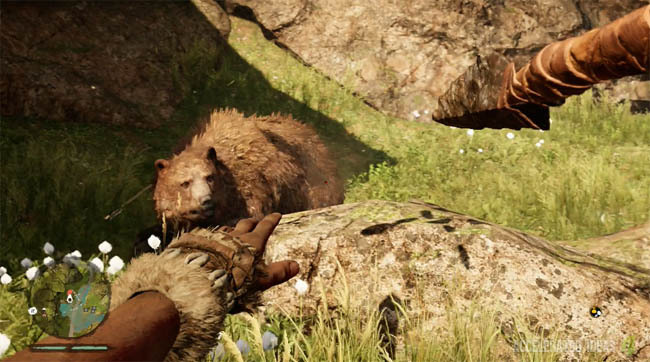 The final part of the fight takes place in the bear's cave and you should use your beast companions to distract the bear long enough to finish him off using your spears or tame him for your collection. This hunt takes place in the far south of the world map, shown on the image above. Upon starting the quest be ready with your spear as you're pounced upon by two wolves. Finish them off and follow the scent trail once again to locate a dead bear before venturing onto the pond and inspecting the dead villlager. Follow the trail to the three Wenja villagers and free them to start a fight with several wolves. 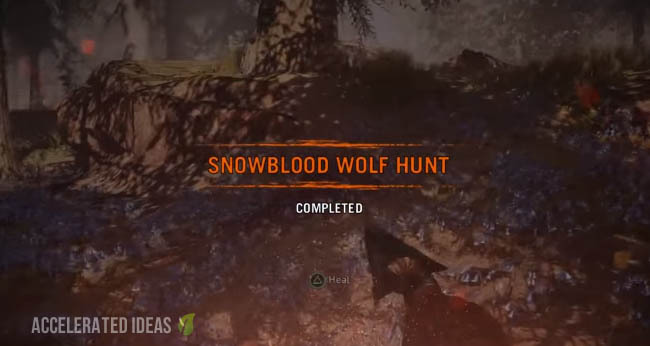 The process of following the blood trail and killing wolves repeats a few times before you finally meet the Alpha Snowblood Wolf which is the prime target of this Beast Hunt. use your spear as you normally would and call in your prefered companion such as the large Bear or Sabretooth to help you.